2) Improper use of gear - side loading shackles, improper use of wire-rope clips, hooking straps and cables to themselves without understanding the significant loss of load rating incurred, etc. 3) Unsafe practices - not keeping the area clear, handling wire rope with bare hands, etc. 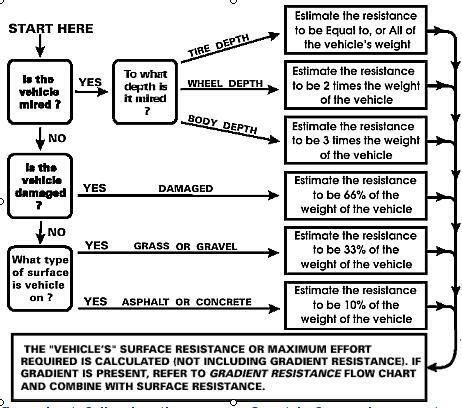 - The U.S. Army vehicle recovery manual, Warn's Guide to Winching, Magazine Articles, and other web pages. Hoisting refers to the vertical lifting of materials. This covers everything from Search and Rescue equipment/aircraft to enormous building cranes. There is an entire industry devoted to the safe and efficient practice of hoisting. Engineering is thorough and industry standard's are strict. In marked contrast, there are few, if any, industry standard for recreational vehicle winching (winching being the movement of objects in a horizontal, or mostly horizontal, plane), either in terms of safety, engineering and design practices, or whatever. As such, manufacturers can (and do) make all sorts of claims about product fitness and ratings based on no established standards. You will understand this thoroughly after having read this entire article. This little-known fact is another one of the primary reasons I am writing this article - so that consumers, users, and even bystanders can be better educated about what they are dealing with, the risks involved, and what some of the physics involved is...because there is no safety in simply relying on what's printed in a manufacturer's glossy catalogue. Often they don't tell the whole story, and even if they did - it wouldn't be based on industry, government, or accepted scientific standards. A lot of the information I have drawn upon in writing this article comes from the hoisting industry, simply because that is where the accurate and factual data is to be found. A complete list of references appears at the end of the article. Where there are marked differences between hoisting and winching in the subject I am discussing, I have attempted to alert the reader. The hoisting and lifting industry has strict safety standards, and for obvious reasons, as the vertical lifting of equipment and personnel is an inherently dangerous and risky business. This is the reason why I have recommended the adoption of as much of the hoisting industries safety practices, strict though they are - because I consider 4x4 recovery no less dangerous or risky than hoisting - especially when one considers how many people often crowd around the operation no matter how much you try to keep them clear, and in particular the woefully undersized wire ropes (cables) used on all recreational 4x4 recovery winches (much more on this later). If you take nothing else away from this article, know this: EVERY time you mount an operation to recover a stuck 4x4, be it by winching, jacking, yank strap or whatever, you are playing with lethal force. The damage caused by equipment failure, or improper operation, can and WILL maim and kill people. NEVER underestimate it. There is a line in a movie that expresses it best. I forget to what it was the speaker was referring, but he may as well have been talking about any piece of recovery gear - particularly the winch and wire rope. He said "The minute you stop respecting this, it kills you." KEEP THAT IN MIND AT ALL TIMES. bird cage --A colloquial term describing the appearance of wire rope forced into compression. The outer strands form a cage and, at times, displace the core. bleeding line --A condition caused when wire rope is overloaded, forcing the lubricant in the cable to be squeezed out and run excessively. block --A term applied to a wire rope sheave (pulley) enclosed inside plates and fitted with some attachment such as a hook or shackle. bright rope --Wire rope made of wires that are not coated with zinc or tin. cable --A term loosely applied to wire ropes, wire strand, and electrical conductors. Wire rope is the preferred term for winching, hoisting and rigging applications. Wire Rope - often called "cable"
clevis --A U-shaped fitting with holes in each end through which a pin or bolt is run. Also called a shackle. clip --Fitting for clamping two parts of wire rope. come-along --Lever-operated chain or wire rope devices designed for pulling, not lifting; also called pullers. Unlike hoists, the tension is held by a releasable ratchet. 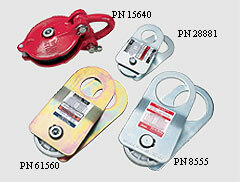 Much smaller and lighter than hoists of equal capacity, they are not intended nor allowed for lifting. D/d ratio -A term regarding wire rope. 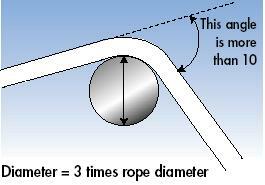 D = Diameter of curvature around which the rope is bent. 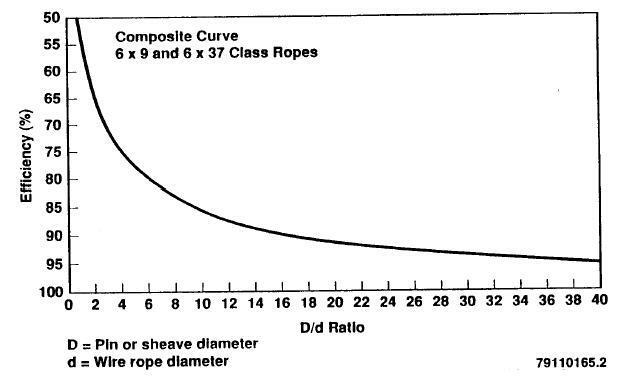 d = diameter of rope. 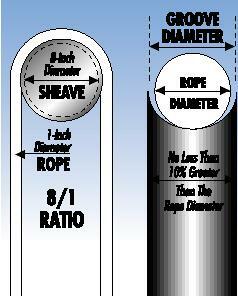 Example: With 0.5-inch-diameter rope passing over a 20-inch-diameter sheave, the D/d ratio is 40. The D/d ratio is a key factor in load-carrying ability and life span of a wire rope. dead end --The point of fastening of one rope end in a running rope system, the other end being fastened at the rope drum. In other words, the short end. The other end is called the live end. design factor --The conservatism used in design calculations. As a function of design, this factor can be based upon the point of equipment failure, such as crane tipping, and brake stopping capacity, or based upon strength of materials, ultimate, nominal, or yield. Consensus standards express design factors as a ratio (for example: 5:1, 3:1, 3.5:1) or as a single number (for example: 5, 3, or 3.5, understood to mean to 1). Although a design factor is sometimes referred to as a safety factor, design factor is the preferred term. An inexperienced person may incorrectly assume this factor of design conservatism will make up for such conditions as shock loading, poor rigging, improper equipment selection, and overload conditions. diameter (wire rope) --The diameter of wire rope is the diameter of the circle that will contain the rope. 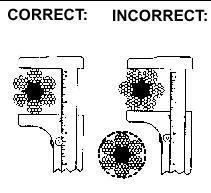 The following diagram illustrates the concept by showing the correct and incorrect ways of measuring wire rope diameter. 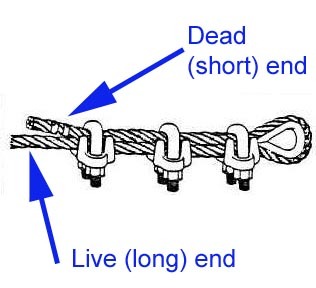 Dog leg --Permanent short bend or kink in wire rope caused by improper use. dynamic loading --Loads introduced into the machine or its components by forces in motion. efficiency (wire rope) --Ratio of a wire rope's measured breaking strength and the aggregate strength of all individual wires tested separately, which is usually expressed as a percentage. The breaking strength of wire ropes seldom exceeds 90 percent of the aggregate strength of all the wires, the average being about 82.5 percent. elastic limit --Limit of stress above which a permanent deformation takes place within the material. This limit is approximately 55 to 65 percent of breaking strength of steel wire ropes. end termination --The treatment at the end or ends of a length of wire rope, which is usually made by forming an eye or attaching a fitting, designed to be the permanent end termination on the wire rope that connects it to the load. 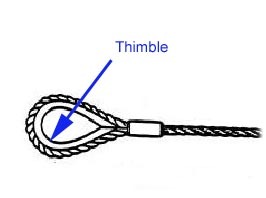 eye or eye splice --A loop with or without a thimble formed in the end of a wire rope. The most common end termination. fatigue --The phenomenon leading to fracture under repeated or fluctuating stresses having a maximum value less than the tensile strength of the material. fitting --Any accessory used as an attachment for wire rope. 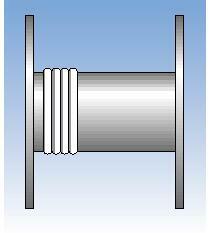 flange point --A point of contact between rope and drum flange where the rope changes layers. fleet angle --The maximum angle between a rope and the line perpendicular to the drum on which it winds. Flemish eye --A type or method of making a wire rope eye splice. Same as a Molly Hogan. grades, rope --Classification of wire rope by its breaking strength. In order of increasing breaking strengths: iron, traction, mild plow steel, plow steel, improved plow steel, and extra-improved plow steel. 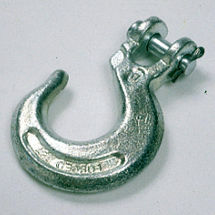 hook -- Common fitting on the end of a wire rope, chain, or other rigging tackle. idler --Sheave or roller used to guide or support a rope. It is also used as a slang expression for an equaling sheave. The most commonly encountered in 4x4 winching would be the "rollers" of the typical roller fairlead. kink --Permanent distortion of wires and strands resulting from sharp bends. load, rated --The maximum static load for which a winch, hoist, or crane is designed. It is a vertical load for crane�s and hoists, and a horizontal load for winches. See rated capacity. load rating --Rating in pounds established by the manufacturer. load, safe working (SWL) --The maximum load a piece of equipment (or tackle) can handle without exceeding the rated capacity (the rated capacity of the lowest capacity item used in the pull or lift). See load, rated. load, working --The external load, in pounds applied to the winch or hoist. The weight of load-attaching equipment is included as part of the working load (e.g., load blocks, hooks, shackles, and slings). NLGI Grade number --A grade number defining the consistency of grease in accordance with methods prescribed by the National Lubricating Grease Institute. nondestructive examination (NDE) --A name applied to a variety of tests which make use of indirect means to locate material discontinuities (e.g., radiography, dye penetrant, magnetic particle, ultrasonics). pawl (dog)--A device for positively holding a member against motion in one or more directions. pitch diameter --The distance, measured through the center of a drum or sheave, from center to center of a rope passed about the periphery of the drum or sheave. rated load (capacity)--The maximum load designated by the manufacturer for which a winch, hoist, rigging, or other device is designed and built. rated rope (line) pull --The manufacturer�s recommended load in pounds (kilograms) applied to the rope attached to the hoist drum. rope --Refers to wire rope unless otherwise specified. rope drum --That part of a winch that consists of a rotating cylinder with side flanges on which rope is spooled in or out (wrapped). running line --A rope that moves over sheaves or drums. seize --To bind securely the end of a wire rope or strand with seizing wire or strand. seizing strand --Small strand, usually of seven wires, made of soft-annealed-iron wire. seizing wire --A soft-annealed-iron wire. serve --To cover the surface of a wire rope or strand with a wrapping of wire. 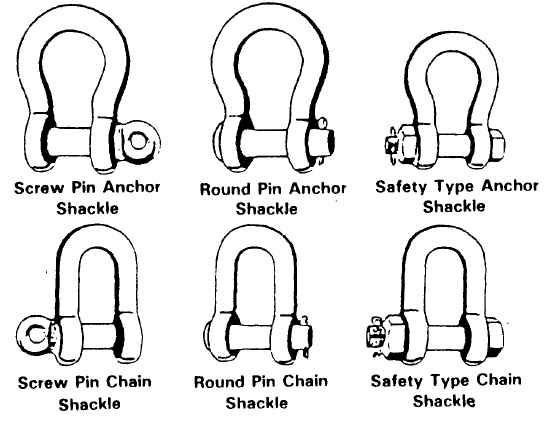 shackle --A type of clevis normally used for lifting. sheave --A wheel or pulley with a circumferential groove designed for a particular size of wire rope; used to change direction of a running rope. slings --Wire ropes, chains, or synthetic fabric made into forms, with or without fittings, for handling loads. Note that the most common types in 4x4 recovery are "tree saver" straps and lengths of chain with hooks. The following are all technically "slings"
splicing --Interweaving of two ends of ropes to make a continuous or endless length without appreciably increasing the diameter. Also, making a loop or eye in the end or a rope by tucking the ends of the strands. spooling (rope) --Winding of rope on a cylindrical drum in evenly spaced, uniform layers. strength margin --The ratio of structural failure load (or stress) to actual or permitted load (or stress). structural competence --The ability of the equipment and its components to support the stresses imposed by operating loads without the stresses exceeding specified limits. swaged fittings --Fittings in which wire rope is inserted and attached by a cold-forming method. The strongest type of end fitting, but not commonly seen in 4x4 winching. tackle --Those pieces of rigging such as slings, spreader bars, chokers shackles, thimbles, eyebolts, rings, or other handling fixtures used for attachment of the load to the crane or hoist. thimble --Grooved-metal fitting designed to prevent crushing or overstressing wire rope at the terminal end which is used to protect the eye of a wire rope or sling. ultimate strength --The maximum conventional stress, tensile, compressive, or shear that a material can stand without failure. 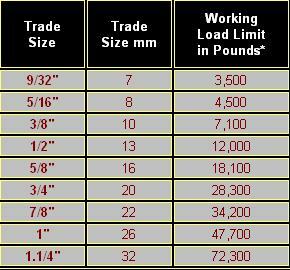 working load limit --WLL (see rated capacity). 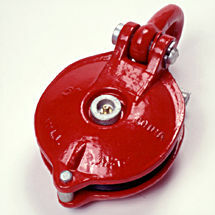 Every single piece of tackle used in a recovery operation, from tow hook to shackle to winch hook to wire rope end termination to the wire rope itself to the winch and to the winch mounting and structure of the vehicles themselves absolutely MUST be capable of SAFELY handling the loads that will be imposed. Let me say it again...EVERY PIECE. It's no good having a 12,000lb winch with a honking new 1/2" thick wire rope, if that wire rope terminates in an underrated hook, or even less obvious, has an improperly done end termination (very common - particularly the improper use of wire rope clips - more on this later). I see this all the time, and I believe some major manufacturers are not terribly good about informing the buyers and users of their products of this concept. This is a critical step in both the conduct of a winch recovery (because you need to be absolutely sure that EVERY single piece of equipment used in the task is strong enough and will not fail and thereby endanger life and limb), and in the selection/purchase and decision to use a piece of recovery equipment. It is a calculation where, quite frankly, the manufacturer's recommendations are woefully inadequate. Why? Simply because if they let you in on how large the forces really are, it would leave you realizing that they are unable to economically produce a winch of sufficient capacity in anything resembling a small, light, or economical enough package. They get away with it, because, as I said, there are virtually no regulations or standards governing the industry. I'm not saying all 4x4 winches are inadequate, dangerous, or useless. But I am saying that the forces involved are often much greater than the manufacturer's would have you believe, and you will be far more capable and SAFER if you approach your 4x4 recovery KNOWING THIS, and knowing the real numbers. Realize, that for reasons of practicality and economics, your 4x4 recovery equipment is almost certainly undersized.....you can still do the job, using the correct techniques, but you will be much SAFER if you keep this in mind. Enough of the pre-amble. 1) Most people are terrible at actually estimating the gross weight of their rig as it sits on the trail, full of gas, tools, equipment, food, camping gear, people, the dog...everything. Heck, in some cases the real figure can actually exceed the GVWR of the vehicle. Simple advice here - either err WAY on the heavy side, or get your rig weighed in trail trim. 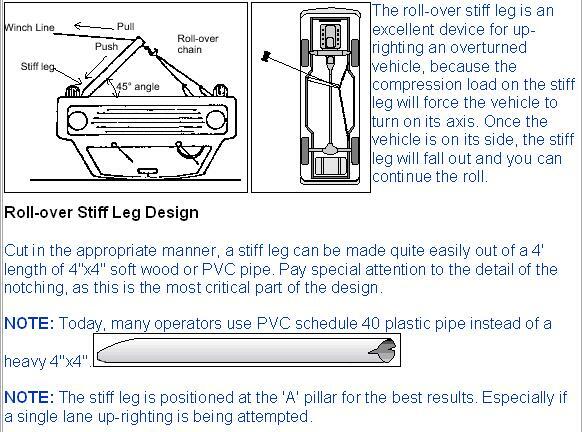 2) More importantly, the "effective weight" of a "stuck" 4x4 is very often FAR more than 1.5 times the GVW. The following data on how to more accurately estimate the "effective weight", is taken from the world of professional heavy recovery - the guys that recover Tractor-trailers that have flipped on their side for instance, as well as U.S., Canadian, and UK Military recovery manuals. A pull of 1/10 LW will cause a free wheeling truck to move on a hard, level surface. A pull of 100% of LW will be required if the truck is stuck to a depth of the sidewall on the tires. A pull of 200% of LW will be required if the truck is stuck to the hubs. 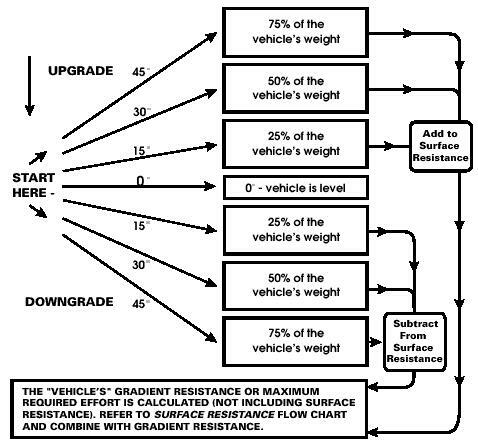 A pull of 300% of LW will be required if the truck is stuck to the frame..
Add surface or damage or mire resistance and grade resistance, and this is your final figure or rolling resistance. This is the amount of pull the winch must apply in order to recover the stuck vehicle. My trail rig fully kitted out weighs in at 5000 lbs. I get stuck down a rock ravine that's about 45 degrees steep, and there are big rocks up to the frame hanging it up. Rolling resistance is 5000lbs x 3 + (5000 x 0.75) = 18,750 lbs. As you can see, this is significantly more than the 5000lbs x 1.5 - 7500lbs the manufacturers would have you believe. You may be wondering how one could ever possibly recover the vehicle in this example, given that the largest commercially available 4x4 recovery winch is 15000 lbs and that most are in the 8-9000lb range. The answer is by using multi-line rigging, which we shall explore in a moment. The least understood, most abused, most critical part of your winch - the wire rope (often called the winch cable, or just cable). As you read the information below - remember this. Wire rope is a machine - a complicated machine made of many moving parts. Learn all you can about it, how to safely handle, use, and maintain it, and of course, remember The minute you stop respecting this, it kills you. COMPONENTS: Wire rope consists of three basic components. MATERIAL: Steel grades in wide use today are IPS (improved plow steel), EIPS (extra improved plow steel), sometimes also referred to as XIPS, XIP, or EIP, as well as EEIPS (extra, extra improved plow steel). Steel core consists of strands of wire wrapped around a steel core. Steel core is not as susceptible to crushing as fiber core. Fiber core, on the other hand, is composed of wire wrapped around a fiber or man-made center. An independent wire rope core, (IWRC), adds strength (7�% min.) and provides resistance to crushing. This style of wire rope best serves a car carriers winch. A 6x19 wire is more durable than the more flexible 6x37 wire. These are composed of manila, jute, sisal or more recently, man-made polypropylene, offering better resistance to rotting, drying out and other forms of deterioration. Fiber core "cushions" the steel strands during operation. As the core is usually impregnated with lubricant before manufacture, it continues to act as an internal lubricator during the operation of the rope. Fiber core is less violent than steel core as it recoils after failure (breaking). 6 x 7 Class: Containing 6 strands that are made up of 3 through 14 wires, of which no more than 9 are outside wires. 6 x 19 Class: Containing 6 strands that are made up of 15 through 26 wires, of which no more than 12 are outside wires. 6 x 36 Class: Containing 6 strands that are made up of 27 through 49 wires, of which no more than 18 are outside wires. 8 x 19 Class: Containing 8 strands that are made up of 15 through 26 wires, of which no more than 12 are outside wires. 8 x 19 and 19 x 7 class wire ropes have rotation-resistant properties, excluding elevator ropes. The constructions listed above are just some of the more popular constructions. Galvanized cable. Sometimes referred to as "aircraft cable" but not intended for aircraft use. Note that any class denotes the nominal number of wires in each strand. The actual number of wires may be different. For example 6 x 36 class: strands most commonly consist of 36 wires, or 31, or 41. LAY: indicates how the wires have been laid to form strands and how the strands have been laid around the core. A right regular lay rope (RRL; the most common) has its strands laid right on the rope - similar to threading a right-hand threaded bolt. Regular means that the direction of the wire lay in the strand is opposite to the direction of the strand lay in the rope. (The wires in regular lay rope appear to be in line with the axis of the rope). Wire rope will develop 100% efficiency, that is, break at or above minimum acceptance strength (not less than 2.5% below nominal breaking strength) ONLY under controlled laboratory conditions. Once fittings such as sleeves, clips, sockets, etc. are attached and/or the wire rope passes over a curved surface such as sheaves, pins, etc. its strength is decreased. In the case of wire rope passing over a curved surface this decrease in strength depends on the severity of the bend. In the case of wire rope fittings, the decrease in wire rope strength will depend on the type of fittings used. The wire rope efficiency usually ranges from 70% - 100%. Note, that hand spliced wire rope, while not using any fittings, has less efficiency than properly flemished and swaged wire rope. Wire rope is an elastic member; it stretches or elongates under load. This elongation can be permanent or recoverable. The extent of elongation will depend on the wire rope used and the design factor chosen. While it may be acceptable for many wire rope uses to neglect its elastic properties, they are of critical importance for 4x4 vehicle recovery uses, as a stretched-under-load wire rope stores enormous potential energy that can be explosively released (converted to kinetic energy) when the rope or a fitting fails. The result of this can be severe injury or death caused by a scything cable or high velocity projectile that was once part of the recovery rigging. Pre-stretching or breaking-in wire rope will only remove some of the constructional stretch and will not totally eliminate elongation under load. 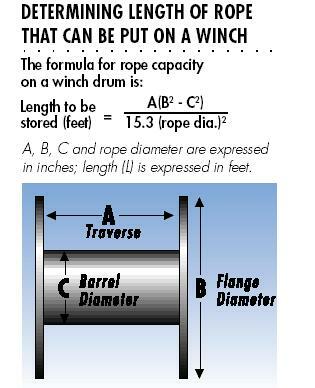 Installation of wire rope on a plain or grooved drum requires a great deal of care. Make certain the wire rope is properly attached to the drum. Keep adequate tension on the wire rope as it is wound onto the drum. Guide each wrap as close to the preceding wrap as possible, or follow the groove in case of a grooved drum. For a better understanding of wire rope I highly recommend the Wire Rope Users Manual by the Wire Rope Technical Board. In order to know the strength of your wire rope, you need to know it's class and material. For example, is it 6x19 Improved Plow Steel, or is it 7x19 Galvanized (aircraft) cable? Most winches sold for the 4x4 market come with 5/16" or 3/8" diameter 7x19 galvanized wire rope. Below is a table listing the specifications for 7x19 Galvanized - the most common type supplied with and replaced on 4x4 winches. Also shown is 7x19 Type 304 Stainless Steel. It's easy to see the potential for problems when taking into account the factors described above. If your Warn HS9500 winch came with 5/16" wire rope, it has a nominal breaking strength of approximately 9,800 lbs. Remember, that's at 100% efficiency under laboratory conditions ONLY. Add some fittings, wind it on a drum, and use it a couple of times and the breaking strength can be way below the force the winch can generate...which can be very dangerous if not understood and respected. Also, remember that's BREAKING STRENGTH, not Safe Working Load with a design factor. Just for illustrative purposes, if one were to apply hoisting industry guidelines and use a design factor of 5, that brand new 5/16" rope would have a safe working load of 9,800 / 5 = 1960lbs under ideal conditions. If the cable was well used, not particularly well maintained, and had a less than optimal end termination (sound like any you've seen?) that could drop it's efficiency to 70% or less, so keeping the same design factor (although admittedly the purpose of the design factor is to account for such losses in efficiency) would mean a SWL of 1960 x 70% = 1372 lbs !!!!!! Add the fact that you totally stuck rig could easily have a rolling resistance of up to 10-15,000 lbs, is it any wonder these things fail and people get hurt! Bottom line - understand your gear and it's limitations, maintain it well, replace when worn, and treat it as lethal, and you're much more likely to have an effective and SAFE winching experience. All 7x7 and 7x19 galvanized cable is in accordance with proposed A.S.T.M. National Standard on Wire Rope for General Purposes, as applicable. ** According to Federal Specifications RR-W-410D. "Meeting dimensional and strength requirements of MIL-W-83420E. The lubrication ropes receive during manufacture is adequate only for initial storage and the early stages of the rope�s service life. A winch's wire rope should be maintained in a well-lubricated condition. It is important that lubricant be applied as part of the maintenance program. The lubricant must be compatible with the original lubricant, so the rope manufacturer should be consulted. The lubricant applied should be of the type that does not hinder visual inspection. The surface of some ropes may become covered with dirt, rock dust or other material during their operation. This can prevent field-applied lubricants from properly penetrating into the rope, so it's a good practice to clean these ropes before you lubricate them. The lubricant you apply should be light-bodied enough to penetrate to the rope's core. You can normally apply lubricant by using one of three methods: drip it on rope, spray it on or brush it on. In all cases, you should apply it at a place where the rope is bending, such as around a sheave. We recommend you apply it at the top of the bend because that's where the rope's strands are spread by bending and are more easily penetrated. In addition, pressure lubricators are available commercially. Your rope's service life will be directly proportional to the effectiveness of the method you use and the amount of lubricant that reaches the rope's working parts. A proper lubricant must reduce friction, protect against corrosion and adhere to every wire. It should also be pliable, and not crack or separate when cold, yet not drip when warm. Never apply heavy grease to the rope because it can trap excessive grit, which can damage the rope. Nor should you apply used "engine oil" because it contains materials that can damage the rope. After wire rope replacement, and before the initial load cycle, verify the following conditions. 1. The rope attachment points to the hoist drum and dead end (if applicable) are properly installed. 2. Fasteners are properly torqued. 3. Reeving is in accordance with the manufacturer's recommendations. After rope replacement and before returning the equipment to service, it is recommended that the winch be cycled from maximum rope out to fully spooled in eight to ten times with 10 percent to 20 percent of rated load. A new rope will stretch and unlay slightly, after initial cycling as described, the wire rope should be carefully re-spooled so as to allow flat, even wraps on the drum. A rope should not be stored on the drum in a twisted or kinked fashion. After the initial load cycle has been completed, you should verify that the fasteners on drum and/or dead end have been retorqued. Check the general condition of the wire rope. Also, look for localized damage and wear, especially at wire rope attachments. Inspect all parts that come in contact with the wire rope. Poor performance of wire rope can often be traced back to worn or wrong-sized sheaves, drums, rollers, etc. Look for kinks, broken wires, abrasions, lack of lubrication, rust damage, crushing, reduction of diameter, stretch or other obvious damage. If any of these conditions exists or if there is any other apparent damage to the wire rope, retire the wire rope according to the instructions below. When in doubt about the extent of the damage, retire the wire rope in question immediately. Without laboratory analysis, it is impossible to determine the strength of damaged or used wire. Thus, you will not be able to tell whether wire rope with any amount of damage is safe to use. 3. Broken or cut strands. 6. Severe kinking, crushing, cutting, or unstranding. All wire ropes feature design characteristic trade-offs. In most cases, a wire rope cannot increase both fatigue resistance and abrasion resistance. For example, when you increase fatigue resistance by selecting a rope with more outer wires, the rope will have less abrasion resistance because of its greater number of smaller outer wires. When you need wire rope with greater abrasion resistance, one choice is a rope with fewer (and larger) outer wires to reduce the effects of surface wear. But that means the rope's fatigue resistance will decrease. That's why it's important to choose a wire rope the same way any other machine is chosen-very carefully. You must consider all operating conditions and rope characteristics. 1. Strength - Wire rope strength is usually measured in lbs or tons. In published material, the strength is shown as minimum breaking force-calculated strength figures that have been accepted by the wire rope industry. When placed under tension on a test device, a new rope should break at a figure equal to (or higher than) the minimum breaking force shown for that rope. The minimum breaking force applies to new, unused rope. A rope should never operate at or near the minimum breaking force. The minimum breaking force must be divided by the appropriate design factor to obtain the maximum allowable working load. During its useful life, a rope gradually loses strength due to natural causes such as surface wear and metal fatigue. 2. Fatigue resistance - Fatigue resistance is the rope's resistance to broken wires from metal fatigue. To have high fatigue resistance, ropes must be capable of bending repeatedly under stress (for example, passing over a sheave). Increased fatigue resistance is achieved in a rope design by using a large number of wires. In general, a rope made of many wires will have greater fatigue resistance than a same-size rope made of fewer, larger wires because smaller wires have greater ability to bend as the rope passes over sheaves or around drums. To overcome the effects of fatigue, ropes must never bend over sheaves or drums with a diameter so small as to bend wires excessively. There are precise recommendations for sheave and drum sizes to properly accommodate all sizes and types of ropes. Every rope is subject to metal fatigue from bending stress while in operation; therefore, the rope's strength gradually diminishes as the rope is used. 3. Crushing resistance - Crushing is the effect of external pressure on a rope, which damages it by distorting its cross-sectional shape, its strands, or its core. It normally is the result of multiple layer spooling on a drum. Crushing resistance, defined as a rope's ability to withstand or resist external forces, is a term generally used to express comparison between rope. When a rope is damaged by crushing, wires, strands, and core are prevented from sliding and adjusting normally during operation. In general, ropes with an independent wire rope core (IWRC) are more crush resistant than fiber core ropes. Regular lay ropes are more crush resistant than lang lay ropes. Six-strand ropes have greater crush resistance than 7-strand, 8-strand, or 19-strand ropes. Compacted strand ropes are more crush resistant than standard round-strand ropes. 4. Resistance to metal loss and deformation - Metal loss refers to the actual wearing away of metal from the outer wires of a rope, and metal deformation is the changing of the shape of outer wires of a rope. In general, resistance to metal loss by abrasion, or abrasion resistance, refers to a rope's ability to withstand metal being worn away along its exterior. This reduces the strength of a rope. The most common form of metal deformation is generally called peening because outside wires of a peened rope appear to have been hammered along their exposed surface. Peening usually occurs on drums and is caused by rope-to-rope contact during spooling. It may also occur on sheaves. Peening causes metal fatigue, which in turn may cause wire failure. The hammering-which causes the metal of the wire to flow into a new shape-realigns the grain structure of the metal, thereby affecting its fatigue resistance. The out-of-round shape also impairs wire movement when the rope bends. 5. Stability - The word "stability" is most often used to describe handling and working characteristics of a rope. It is not a precise term because the idea expressed is to some degree a matter of opinion and is more nearly a personality trait than any other rope feature. For example, a rope is referred to as stable when it spools smoothly on and off a drum-or it doesn't tend to tangle when a multi-part reeving system is relaxed. Strand and rope construction contributes mostly to stability. Preformed rope is usually more stable than non- preformed, and regular lay rope tends to be more stable than lang lay. A rope made of seven-wire strands will usually be more stable than a more complicated construction with many wires per strand. There is no specific measurement of rope stability. 6. Bendability - Bendability relates to a rope's ability to bend easily in an arc. The primary factors that affect this capability are the diameters of wires that make up the rope; rope and strand construction; metal composition and finish; and type of rope core. Some rope constructions are by nature more bendable than others. Small ropes are more bendable than big ones. Fiber core ropes bend more easily than comparable IWRC ropes. As a general rule, rope containing many wires is more bendable than same-size rope made with fewer, larger wires. 7. Reserve strength - Reserve strength is the percentage of a rope's minimum breaking force represented by the inner wires of the outer strands. This recognizes that outer wires should be the first to be damaged or exhibit wear. Usually, the more wires in each strand of rope, the greater its reserve strength. This is true because of the geometry of a circle: Increasing the number of outer wires in a strand also increases the cross-sectional area occupied by inner wires. Rotation-resistant rope, due to its construction, can experience different modes of wear and deterioration than standard rope. Therefore, reserve strength is based on the percentage of the metallic area represented by the core strand plus the inner wires of the strands of both the outer and inner layers. Reserve strength is especially important where the consequences of rope failure are great. 1. Wire rope WILL FAIL IF WORN OUT, OVERLOADED, MISUSED, DAMAGED, or IMPROPERLY MAINTAINED. 2. In service, wire rope loses strength and work capability. Abuse and misuse increase the rate of loss. 3. The MINIMUM BREAKING STRENGTH of wire rope applies ONLY to a NEW, UNUSED rope. 4. The Minimum Breaking Strength should be considered the straight line pull with both rope ends fixed to prevent rotation, which will ACTUALLY BREAK a new, UNUSED, rope. The Minimum Breaking Strength of a rope should NEVER BE USED AS ITS WORKING LOAD. 5. To determine the working load of a wire rope, the MINIMUM or NOMINAL Breaking Strength MUST BE REDUCED by a DESIGN FACTOR (formerly called a Safety Factor). The Design Factor will vary depending upon the type of machine and installation, and the work performed. YOU must determine the applicable Design Factor for your use. For example, a Design Factor of "5" means that the Minimum- or Nominal Breaking Strength of the wire rope must be DIVIDED BY FIVE to determine the maximum load that can be applied to the rope system. Design Factors have been established by OSHA, by ANSI, by ASME and similar government and industrial organizations. No wire rope should ever be installed or used without full knowledge and consideration of the Design Factor for the application. 6. WIRE ROPE WEARS OUT. The strength of a wire rope slightly increases after the break-in period, but will decrease over time. When approaching the finite fatigue life span, the breaking strength will sharply decrease. Never evaluate the remaining fatigue life of a wire rope by testing a portion of a rope to destruction only. An in depth rope inspection must be part of such evaluations. 7. NEVER overload a wire rope. 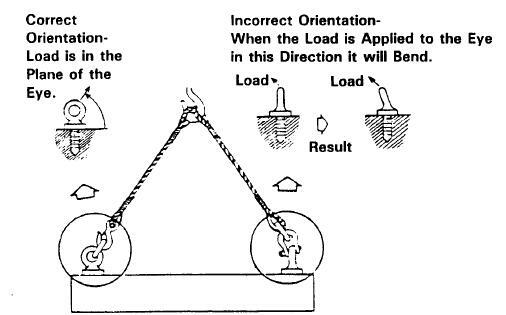 This means NEVER use the rope where the load applied is greater than the working load determined by dividing the Minimum Breaking Strength of the rope by the appropriate Design Factor. 8. NEVER 'SHOCK LOAD' a wire rope. A sudden application of force or load can cause both visible external damage (e.g. birdcaging) and internal damage. There is no practical way to estimate the force applied by shock loading a rope. The sudden release of a load can also damage a wire rope. 9. Lubricant is applied to the wires and strands of a wire rope when manufactured. This lubricant is depleted when the rope is in service and should be replaced periodically. 10. Regular, periodic INSPECTIONS of the wire rope, and keeping of PERMANENT RECORDS SIGNED BY A QUALIFIED PERSON, are required by OSHA and other regulatory bodies for almost every rope installation. The purpose of inspection is to determine whether or not a wire rope may continue to be safely used on that application. Inspection criteria, including number and location of broken wires, wear and elongation, have been established by OSHA, ANSI, ASME and other organizations. IF IN DOUBT, REPLACE THE ROPE. Some inspection criteria on rope, sheaves and drums are outlined further in this Technical Information section. 11. When a wire rope has been removed from service because it is no longer suitable, IT MUST NOT BE RE-USED ON ANOTHER APPLICATION. 12. Every wire rope user should be aware of the fact that each type of fitting attached to a wire rope has a specific efficiency rating which can reduce the working load of a rope assembly or rope system, and this must be given due consideration in determining the capacity of a wire rope system. � Sheaves that are too small, worn or corrugated can cause damage to a wire rope. � Broken wires mean a loss of strength. � Kinks permanently damage a wire rope. � Environmental factors such as corrosive conditions and heat can damage a wire rope. � Lack of lubrication can significantly shorten the useful service life of a wire rope. � Contact with electrical wire and the resulting arcing will damage a wire rope. How much rope will fit on a winch? 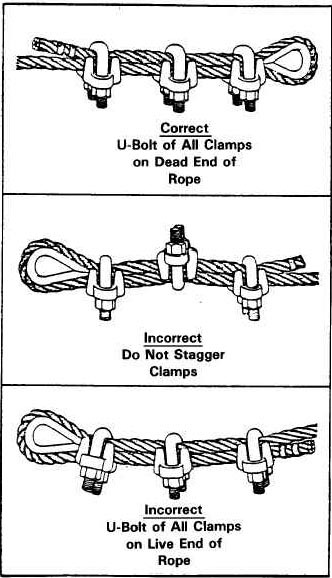 It is critical that the proper end-termination be used on your winch rope. Not only that, but it is critical to understand the effect the type of end termination you use has on the efficiency (strength) of your wire rope. Note that the values differ for wire rope core and fibre core ropes. Note the relatively low value of 80% on the very commonly seen wire rope clips. Imagine the 5/16 7/19 galvanized wire rope on your 9500lb winch. Brand new, under ideal conditions, it's nominal breaking strength is 9800lbs (NO design factor). Put your hook on with wire rope clips, and even if you do it perfectly, that figure drops to 9800x80%=7840lbs....SCARY!!! Pics of the various types of end terminations. 2. Clamps shall be legibly and permanently marked with size and the manufacturer�s identifying mark. 1. Before use, clamps shall be visually inspected for damage, corrosion, wear, and cracks. 2. Verify that the clamp components are marked properly. 3. Ensure that the assembled clamp contains the same size, type, and class parts. 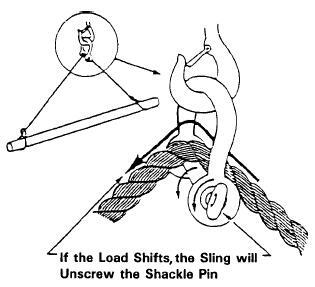 Now you know all about wire rope strength, working load limits, design factors, and the magnitude of the forces involved, it's important to examine some of the other "fittings" or pieces of tackle commonly employed in 4x4 recovery winching. It is worth repeating, any piece of gear you use ABSOLUTELY must have a WLL that is up to the task. The entire operation is only as strong as it's weakest link - don't be one of those people improperly side-loading a shackle or using a puny, under-rated hook on your winch. 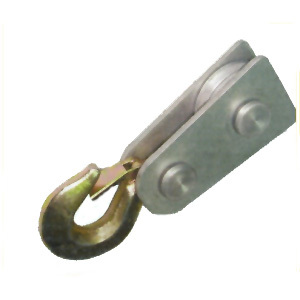 The SWL for a hook used in the manner for which it is intended shall be equal to or exceed the rated load of the chain, wire rope, or other suspension member to which it is attached. The designated SWL applies only when the load is applied in the bowl or saddle of the hook. The manufacturer's identification shall be forged or die-stamped on a low-stress and non-wearing area of the hook. Positive locking hooks. These are the best hooks in my opinion, as it is virtually impossible for the fitting or sling to which the hook is attached to slip out either when it is loose or under tension. Opening and closing the hook requires thumb-activation of a small locking tab (visible on the upper left of the red hook. Regardless of the type of hook, as with all other recovery gear, an inspection program is required for the life of the equipment and safety of you and those around you during recovery. b. Deformation. Damage from chemicals. d. Damage or malfunction of the throat latch, if provided. e. Hook attachment and securing means. a. Deformation. Any bending or twisting exceeding 10 degrees from the plane of the unbent hook. b. Throat Opening. Any distortion causing an increase in throat opening exceeding 15 percent. c. Wear. 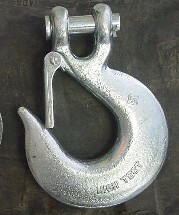 Any wear exceeding 10 percent of the original section dimension of the hook or its load pin. If any of these conditions are found, the hook should be retired and replaced. 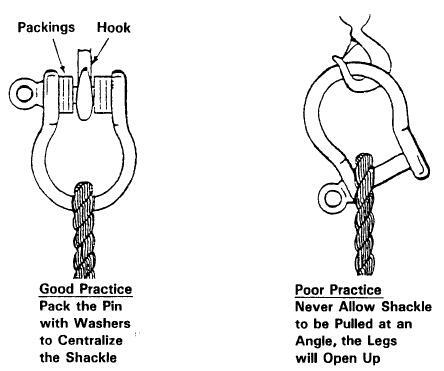 One of the most useful, but also most often misused/abused pieces of recovery gear is the common clevis or shackle. The following should set things straight and allow you to safely and properly make use of the venerable shackle. 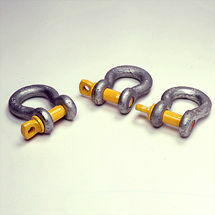 Shackles are manufactured in two configurations for use in rigging: anchor shackle and chain shackle. Both are available with screw pins, round pins, or safety bolts. 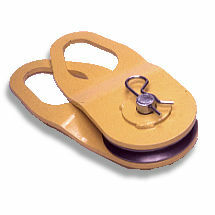 Shackles are sized by the diameter of steel in the bow section rather than the pin size. Design Factors: Shackles manufactured in accordance with RR-C-271 and MIL-S-24214 have a minimum design factor of 5. Shackles manufactured to the requirements of ASTM A148M have a minimum design factor of 4. Each shackle body shall be permanently and legibly marked by the manufacturer. Marking will be raised or stamped letters on the side of the shackle bow with an identifying manufacturer�s name or trademark, shackle size, and safe working load (SWL). Before each use, shackles should be inspected to the following criteria. b. The pin shall show no sign of deformation. c. The shackle shall have no defect that will interfere with serviceability. It doesn't take a lot of imagination, looking at the above picture, to see that a tree-saver strap is a sling, although it is used horizontally rather than vertically. Depending on how it is rigged, it is usually a choker hitch or horizontal basket hitch. 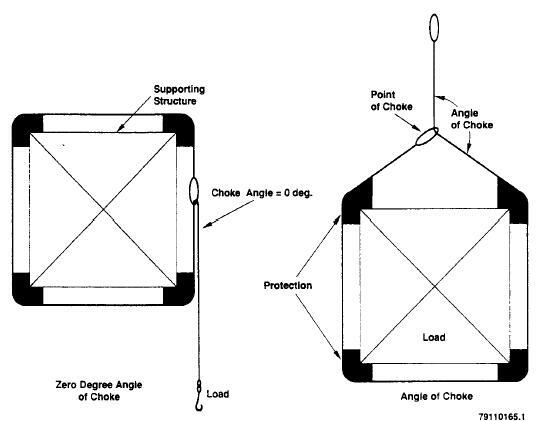 In both cases, the angle from the anchor to the rig winching is very important as it effects the rating / efficiency of the sling. Also, a length of chain with hooks on the end is also technically a "single leg sling". The following pics show some typical types of slings. Again, in our use, the loads will be applied horizontally (or mostly horizontally) rather than vertically, but it is easy to see that different types of slings are often used in 4x4 recovery or using a 4x4 winch to move objects. Slings can be of varying construction, from wire rope, webbing, and chain to synthetic materials and wire or chain mesh. The most common encountered on the trail are webbing (tree saver strap) and chain. Detailed information on Synthetic Web Slings (recovery straps and tree savers, for example) below in the "towing and yanking" section. Slings in Choker Hitch configuration. As you can see, with my 8000lb Warn 8274, it is perfectly safe as a basket hitch, marginal as a straight sling, and not a good idea to use it in a choker hitch configuration. Another piece of gear you see on the trail all the time. It can be extremely useful and versatile, but is very often misused. If chain is going to be used anywhere in a recovery operation (and personally, I think this should be avoided if possible, because of the hazards, and most importantly because often grade, strength, and condition are difficult to verify), it should only be Grade 80 Alloy Steel chain of a size suitable for the task. 1. Hooks, rings, oblong links, pear-shaped links, mechanical coupling links, or other attachments shall have a rated load at least equal to that of the alloy steel chain with which they are used. Chain and attachments should display no wear, nicks, cracks, breaks, gouges, stretch, bends, weld splatter, discoloration from excessive temperature, or excessive throat opening of hooks. 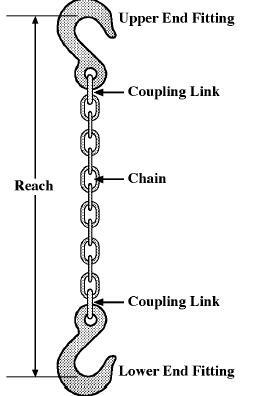 Chain links and attachments shall hinge freely with adjacent links. Latches on hooks, if present, should hinge freely and seat properly without evidence of permanent distortion. 1. Chain having suitable characteristics for the type of load, hitch, and environment shall be selected. 2. The weight of the load shall be within the rated load (working load limit) of the chain. 3. Chains shall not be shortened or lengthened by knotting, twisting, or other methods not approved by the chain manufacturer. 4. Chains that appear to be damaged shall not be used unless they are inspected and accepted as usable in accordance with the periodic inspection requirements stated above. 5. The chain shall be hitched or rigged in a manner providing control of the load. 6. Sharp corners in contact with the chain should be padded with material of sufficient strength to minimize damage to the chain. 7. Portions of the human body should be kept from between the chain and the load and from between the chain and the winch hook. 8. Personnel should stand clear of the recovery. 9. Shock loading is prohibited. 10. Chain should not be pulled from under a load when the load is resting on the chain. 11. Chains should be stored in an area where they will not be subjected to mechanical damage, corrosive action, moisture, extreme heat, or kinking. 12. The load applied to the hook should be centered in the bowl of hooks to prevent point loading on the hook, unless the hook is designed for point loading. 13. Chains should not be dragged on the floor or over an abrasive surface. 14. When used in a choker hitch arrangement, chains shall be selected to prevent the load developed on any portion of the chain from exceeding the rated load of the chain sling components. Only shouldered eyebolts should be used for rigging hardware. Carbon Steel Eyebolts shall have the manufacturer's name or identification mark forged in raised characters on the surface of the eyebolt. Alloy Steel Eyebolts shall have the symbol �A� (denoting alloy steel) and the manufacturer's name or identification mark forged in raised characters on the surface of the eyebolt. Eyebolts should have a minimum design factor of 5, based on ultimate strength. Carbon steel eyebolts shall be made of forged carbon steel. Alloy steel eyebolts are forged, quenched, and tempered with improved toughness properties, intended primarily for low temperature applications. Nuts, washers, and drilled plates shall not be used or assembled to make shouldered eyebolts. Wire type and/or welded eyebolts should not be used in recovery operations. Shoulders should seat uniformly and snugly against the surface on which they bear. 1. Careful visual inspection of each eyebolt immediately before use is mandatory. Eyebolts that are cracked, bent, or have damaged threads shall be discarded. 2. The shank of the eyebolt shall not be undercut and shall be smoothly radiused into the plane of the shoulder. 1. To attain the rated capacity for threaded hole applications, minimum thread shank length of engagement for steel eye bolts should be at least 1.5 thread diameters, and preferably 2 or more. 2. To attain the rated capacity for untapped through-hole applications, use shouldered eyebolts, steel washer, and a nut with required thread engagement. 3. The size of the hole shall be checked for the proper size of eyebolt before installation. The condition of the threads in the hole shall be checked to ensure that the eyebolt will secure and that the shoulder can be brought to a snug and uniformly engaged seat. 2. When installed, the shoulder of the eyebolt must be flush with the surface . When eyebolts cannot be properly seated and aligned with each other, a steel washer or spacer not to exceed one thread pitch may be required to put the plane of the eye in the direction of the load when the shoulder is seated. Proper thread engagement must be maintained. Use a washer with approximately the same diameter as the eyebolt shoulder and the smallest inside diameter that will fit the eyebolt shank. 3. Angular loading of eyebolts should be avoided. Angular loading occurs in any pull in which the pulling force is applied at an angle to the centerline of the eyebolt shank. 4. 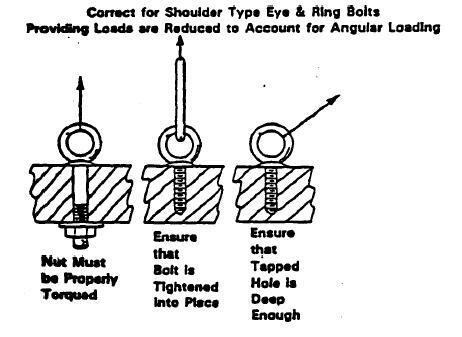 Shouldered eyebolts may be used for angular pulling, providing the limiting conditions in the table below are considered. 5. To keep bending forces on the eyebolt to a minimum, the load shall always be applied in the plane of the eye, never in the other direction. 6. 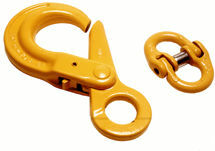 If the hook will not go completely into the eyebolt, use a shackle to avoid loading the hook tip. 7. Slings shall not be reeved through an eyebolt or reeved through a pair of eyebolts. Only one leg of the sling should be attached to each eyebolt. This table taken from the vertical hoisting documentation. For 4x4 recovery use - substitute the word "straight line" for vertical. That is to say - if you are pulling on an eyebolt at an angle to the centerline of the eyebolt shank, reduce the SWL of the eyebolt as above, and re-rig the pull if required. 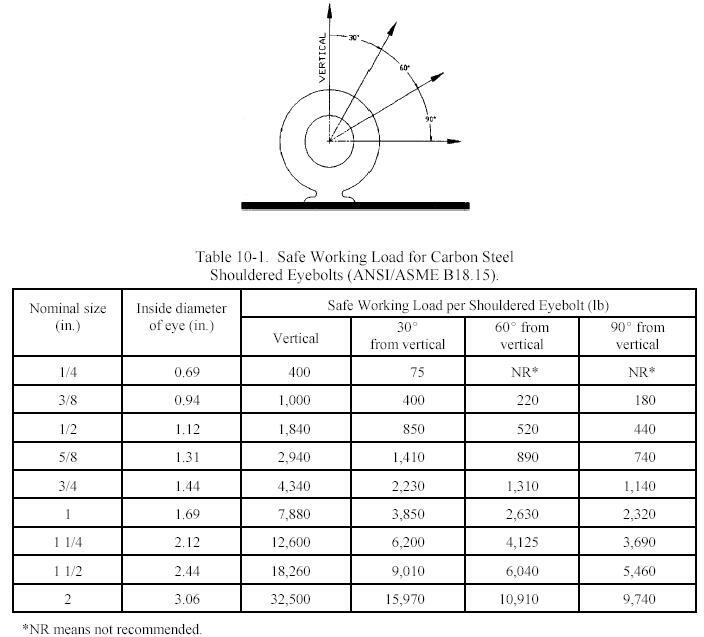 Capacities shown in this table are for carbon steel ASTM A-489 eyebolts at temperatures between 30 *F (-1 *C) and 275 *F (135 *C). Carbon steel is subject to failure from shock loading at temperatures below 30 *F and loses strength at temperatures above 275 *F.
Eyebolts from selected manufacturers may have higher SWL. Regardless of SWL, ensure that eyebolts have a design factor of 5. 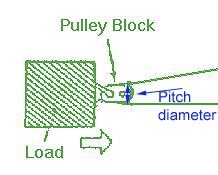 The strength reduction (efficiency) of a recovery rigging setup using any kind of block or sheave is based on the D/d ratio, where D is the pin or sheave diameter, and d is the rope diameter. For example, a rope bent around a pin of equal diameter will have a D/d ratio of 1. The efficiency will be 50 percent. The rope will have only 50 percent of the nominal strength attributed to it. 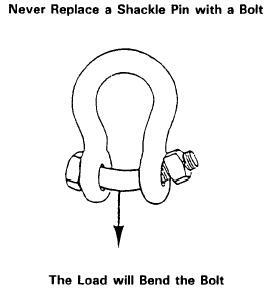 This factor applies to your roller fairlead too, as it is a sheave. To assure maximum efficiency and safety, sheaves for wire ropes should be no less than eight times the rope diameter. The sheave groove diameter should be no less than ten percent greater than the rope diameter. The sheave groove should be round in shape. Sheaves with �V� shaped grooves should be avoided, as they tend to pinch and damage the rope through excessive friction and crushing of the rope fibers. Sheave surfaces should be kept smooth and free of burrs and gouges. Bearings should be maintained to ensure smooth rotation of sheaves. Any sharp bend in a rope under load decreases its strength substantially and may cause premature damage or failure. Where a rope bends more than ten degrees in bending across any surface, the diameter of that surface should not be less than three times the diameter of the rope. Stated another way, the diameter of the surface should be at least three times the rope diameter. A four-to-one ratio (or larger) would be better yet because the durability of the rope increases substantially as the diameter of the surface over which it is worked increases. This factor applies to your roller fairlead too, as it is a sheave. Towing and Yanking vehicles for recovery. A common, quick and easy method of extracting a stuck vehicle is to connect another mobile vehicle to it and yank, pull, or tow it free. Because of the enormous forces generated in this type of operation, extreme care should be exercised. NEVER EVER use chain, wire rope, or a winch to yank another vehicle free. The shock loads developed can multiply the force applied many times, so that a stuck truck requiring a 10,000 lb steady pull to free, can cause a shock-load of 50 000 lbs if jerked or yanked suddenly. This is extremely dangerous to man and machine. As such, only properly designed, constructed, and rated recovery straps should ever be used for yanking vehicles free. DO NOT ever use tow ropes, tow straps, emergency tow ropes etc. These are designed only for easy flat road towing of a non-running vehicle (and are dubious for that, in my opinion) - not for the rigors of off-road extraction and recovery. Make absolutely certain that the anchor points on the vehicles in question are capable of handling the loads imposed. Do not ever use recovery straps in combination with wire rope or chains or other devices. Do not join 2 recovery straps together by knotting them. Care and inspection of nylon recovery straps is extremely important for safe operations, and almost EVERYONE neglects and abuses them (me included!). They should be stored free from water, dirt, and other chemicals. Before use they should be inspected carefully. 5. Stitching shall be the only method used to form eyes. 4. Protection from sunlight or ultraviolet degradation. Design Factor. The design factor for synthetic web slings shall be a minimum of 5. 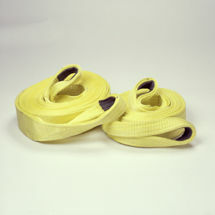 High radiation or chemically active environments can destroy the strength of synthetic web slings. Sling materials can be susceptible to caustics and acids. 1. Slings having suitable characteristics for the type of load, hitch, and environment shall be selected. 3. Slings shall not be shortened or lengthened by knotting or other methods not approved by the sling manufacturer. 6. Sharp corners in contact with the sling should be padded to minimize damage to the sling. 7. Portions of the human body should be kept from between the sling and the load, and from between the sling and the crane hook or hoist hook. 8. 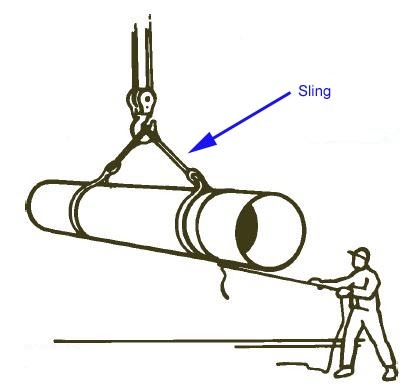 Slings should not be pulled from under a load when the load is resting on the sling. 9. Slings should be stored in a cool, dry, and dark place to prevent environmental damage. 10. Twisting and kinking the strap shall be avoided. 11. In a basket hitch, the load should be balanced to prevent slippage. 12. Slings should not be dragged on the floor or over an abrasive surface. 13. Nylon and polyester web slings lose strength from extensive exposure to sunlight or ultraviolet light. Possible strength loss may be indicated by loss of color in the pick threads or outer jacket. If the user suspects sunlight or ultraviolet light damage the sling shall be taken out of service pending inspection by a qualified person. 14. Hard or brittle spots in the fabric of synthetic slings may indicate a substantial reduction in strength as a result of damage from chemicals or excessive heat. Warn's Guide to winching EXTREMELY limited and basic - personally I think it should include a whole lot more safety information, but it covers some basics for the beginner. U.S. Department of Energy's Hoisting and Rigging Manual chapter 5 - HOOKS EXCELLENT!! Source of much of my information. U.S. Department of Energy's Hoisting and Rigging Manual chapter 8 - WIRE ROPE EXCELLENT!! Source of much of my information. U.S. Department of Energy's Hoisting and Rigging Manual chapter 9 - SLINGS EXCELLENT!! Source of much of my information. U.S. Department of Energy's Hoisting and Rigging Manual chapter 10 - RIGGING HARDWARE EXCELLENT!! Source of much of my information. http://www.wreckmaster.com - Professional wreckers / recovery operator's school. Excellent tech info on site. http://www.craneinstitute.com/mall/Manuals.asp - The Crane Institute of America's Technical Manual page. http://www.winchwarehouse.co.uk/default.htm - Winch Warehouse - U.K. recovery supplier. AISC--American Institute of Steel Construction. AISE--Association of Iron and Steel Engineers. AISI--American Iron and Steel Institute. ASLE--American Society of Lubrication Engineers. ASME--American Society of Mechanical Engineers. ASNT--American Society for Nondestructive Testing. ASTM--American Society for Testing Materials. HHRC--Hanford Hoisting and Rigging Committee. PCSA--Power Crane and Shovel Association. F541, Standard Specifications for Alloy Steel Eyebolts. C RR-C-271, Chains and Attachments, Welded and Weldless. RR-W-410D, Wire Rope and Strand. � Part L, Cranes, Derricks, Hoists, Elevators, and Conveyors. 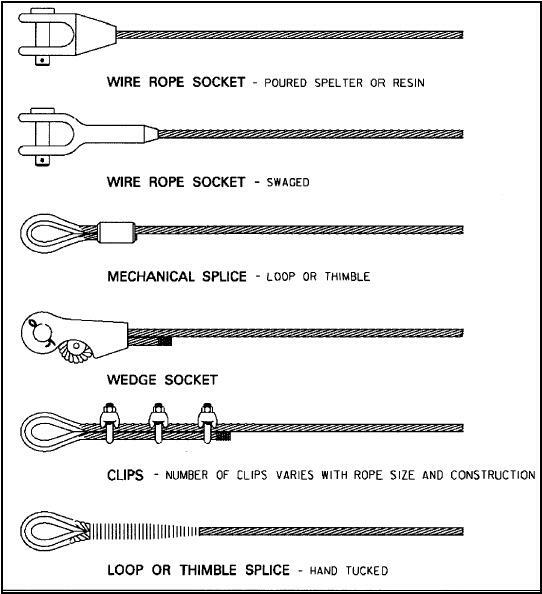 � Wire Rope Sling Users Manual, 1990. � Wire Rope Users Manual, 3rd Edition, 1993.